A renewable energy standard (RES) requires utility companies to source a certain amount of the energy they generate or sell from renewable sources such as wind and solar. There are many variants to an RES policy, including clean energy standards (which allow nuclear and low-polluting non-renewable energy sources like natural gas) and renewable goals (which are non-binding). 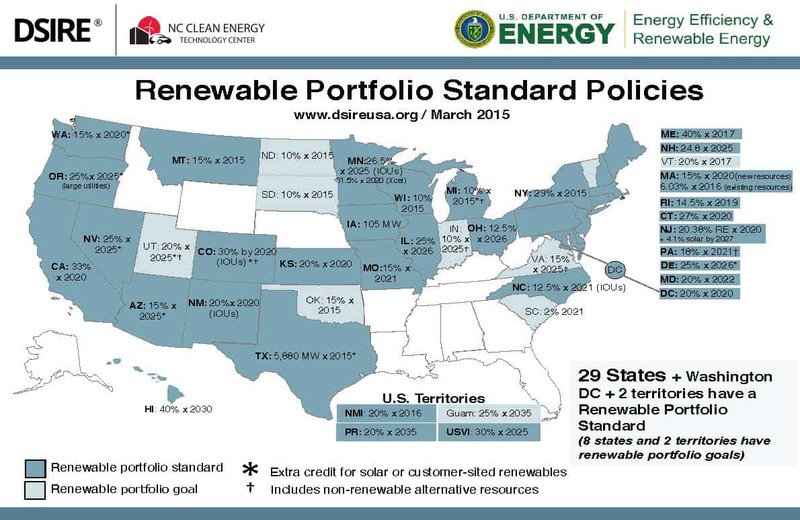 They are sometimes also called renewable portfolio standards (RPS). An RES establishes incremental targets which increase over time; for example, a state could require utilities to increase their renewable generation by 2% each year for the next ten years, resulting in 20% renewable power in that state. The targets, compliance mechanisms, and qualifying resources of RES policies can vary widely from state to state. Some states include more specific requirements (called carve-outs), which further incentivize the deployment of particular market segments or energy technologies. RES policies are designed to encourage competition between energy project developers to take advantage of the vast renewable energy resources that exist in the United States. Numerous studies have shown that an ambitious RES will help to create thousands of new jobs, spur economic development, reduce pollution, and save consumers money on their utility bills. According to extensive analysis by the U.S. Department of Energy's National Renewable Energy Laboratory (NREL) and Lawrence Berkeley National Lab (LBNL), RES policies do not significantly raise electricity rates, and often result in cost savings for consumers. They also spur local demand for renewable technologies, creating jobs and economic development. Utilities that are subject to an RES must obtain renewable energy certificates or credits (RECs) for the required percentage of their generation. A REC is created for each megawatt-hour of electricity (or equivalent energy) generated from a qualifying renewable energy source. In order to allow utilities some flexibility in complying with the requirement, RECs may be bought, sold or traded separately from the associated energy. Functional REC markets protect utility ratepayers by helping to ensure that the lowest-cost energy is used to comply with the standard. If an RES policy has a solar-specific carve-out, the compliance mechanism is called a solar REC, or SREC. Most solar energy technologies such as photovoltaic (PV) and concentrating solar power (CSP) qualify under existing and proposed RES policies. Through a solar or distributed generation carve-out, an RES policy can better facilitate the development of distributed solar markets. 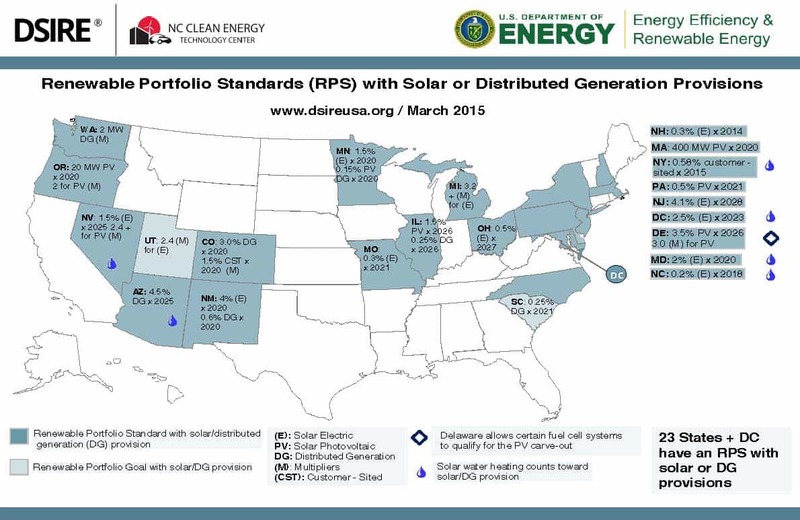 When combined with policy initiatives like interconnection standards and net metering, an RES can help facilitate the development of more solar energy systems on rooftops and in communities across the U.S.